Proven to last up to 18 months, Juvéderm Vollure™ XC is an injectable gel designed to soften moderate to severe parentheses lines and wrinkles around the nose and mouth. Are you noticing parentheses lines forming around your nose and lips? Wrinkles around the nose and mouth, also known as parentheses lines, become more apparent over time because skin naturally loses elasticity. Juvéderm Vollure™ XC, the newest addition to the Juvéderm® collection of fillers, adds volume to smooth the lines and wrinkles around your nose and mouth, giving you the natural-looking, long-lasting results you desire. 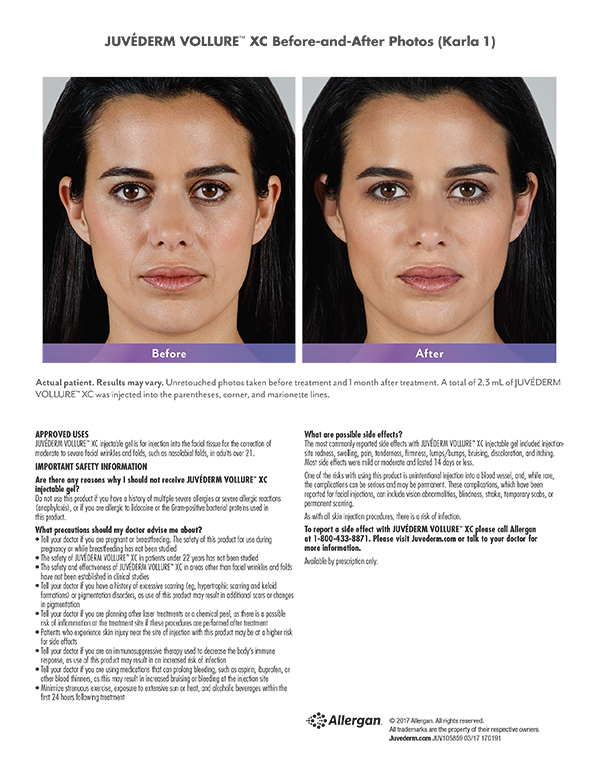 Juvéderm Vollure XC, much likeJuvéderm Volbella® and Juvéderm Voluma™ XC, is made with Vycross® technology, which contributes to its long-lasting results. Juvéderm Vollure XC is designed with a balance of gel firmness and low cohesivity, creating a formula that adds subtle volume to correct moderate to severe wrinkles and folds on the face. Juvéderm Vollure XC is also proven to last up to 18 months, the longest lasting result in clinical studies in the nasolabial folds.